(CNN) - It got ugly pretty quickly in the Senate battle in Iowa, a crucial contest that could decide whether the Republicans take control of the chamber in the midterms. The campaign of Republican nominee Joni Ernst Thursday charged that the Democratic nominee in the race, Rep. Bruce Braley, is "degrading women by comparing Joni Ernst to a 'chick' in his latest campaign ad." 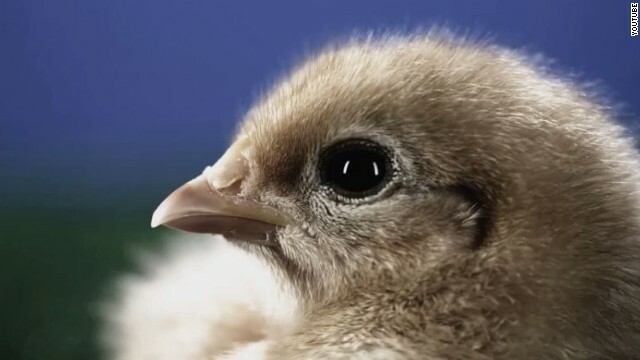 The Ernst campaign is crying foul over a television commercial titled "Peep" put out Wednesday by the Braley campaign that starred a baby chick. The spot from Braley played off an ad that Ernst went up with earlier this year. In that commercial, which was the first of her campaign, the candidate said "I'm Joni Ernst. I grew up castrating hogs on an Iowa farm so when I get to Washington, I'll know how to cut pork." The provocative spot quickly gave statewide and even national attention to the little known state senator. It was followed by another ad that showed Ernst, a lieutenant colonel in the Iowa National Guard, riding up to a gun range on a motorcycle. The commercials put Ernst in the spotlight and arguably helped turn her into the front runner in the free-for-all battle for the GOP Senate nomination. Ernst ended up winning Tuesday's primary by a landslide. Ernst hopes to make history in November as the first woman to represent Iowa in Congress. The general election winner will succeed longtime Democratic Sen. Tom Harkin, who is retiring at the end of the year. If the Republicans can flip Harkin's seat and five other Democratic held seats, they would win control of the Senate. Braley, who was unopposed in the Democratic primary, went up Wednesday with his spot attacking Ernst's record in the state legislature. "We've all heard the one about pigs squealing. But when Joni Ernst had the chance to do something in Iowa, we didn't hear a peep. In the state Senate, Ernst never sponsored a bill to cut pork. Never wrote one measure to slash spending. In fact, the Iowa Republican said she backed measures to actually increase spending. Joni Ernst ads are hard to forget, but her record just doesn't cut it," said the narrator in the ad. Thursday morning the National Republican Senatorial Committee slammed Braley. "Let's not forget that national Democrats have made claims of misogyny and unfair attacks against women the centerpiece of their electoral strategy. Does anyone doubt that if a male Republican candidate ran an ad comparing a female Democratic candidate to a chick, reporters' inboxes would be filled with outraged press releases demanding that the ad be condemned and taken down? Of course not," wrote NRSC press secretary Brook Hougesen, in an email to reporters. And Ernst spokesperson Gretchen Hamel put out a statement saying that Braley "degrades and insults Iowa women by comparing Joni Ernst to a 'chick.'" In her email, Hamel also listed three spending limit bills that Ernst co-sponsored. Thursday afternoon, the Braley campaign responded. "That we still haven't heard a peep from state Sen. Ernst's campaign on the substance of our ad shows just how clearly her record does not live up to the image she's portraying on TV. The facts matter, and the truth is, state Sen. Ernst talks a lot about cutting pork, but her actions are something else entirely," said Braley campaign manager Sarah Benzing. leftist democrats only use women, just like all others. to these extremists, you're not a real woman if you don't buy their garbage and vote for them. same thing with the black vote. stop being lied to an used by the leftists democrats america. I can't wait to see Reid's face when the nuclear option is used against him and him democrat minions. Lol you gotta love/pity republicans. There's nothing worse than a fool with a cause. Red State Takers just like the teaparty swill always talk a good game but when they have a chance to cut expenditures they cave in worse than the GOP, and Ernst is in the same mold if the c u nt don't walk the talk she needs defeated. Meanwhile you forget that you Righties are legislating their uteruses. I wouldn't go where you're heading. It won't end well. Now that they have been CRUSHED by McConnell, can't wait to see Thom Tillis,Sheldon Adelson,Rupert Mourdoch,Karl Rove,Grover Norquist and the GOP stuff Jeb Bush down the tea party's throats EXACTLY like they stuffed Romney down. Sorry Joni. If you're gonna put out ridiculous ads, you can't complain when they come back to haunt you. Funny that I hear Teapublicans complain about how people are too thin skinned and sensitive but are so quick with the faux outrage. "I'm Joni Ernst. I grew up castrating hogs on an Iowa farm so when I get to Washington, I'll know how to cut pork. ", Ernst, a lieutenant colonel in the Iowa National Guard, riding up to a gun range on a motorcycle. These attributes are what make Ernst ready for the 3 am phone call , she's highly skilled at something ! leftist democrats only use women ? Can you at least give me one example ? And as a man do you at all feel used by Sarah Palin or Michele Bachmann , that they led you on , gave you false hope , promised you boogie fever only to leave you with the down home the blues ? The GOP is hilarious. The GOP candidate was using a hog reference, so she was comparing men to hog and much as they are comparing women to chicks. This is an attempt at the GOP trying to use women for their benefit. Sad. The ad isn't about a 'chick'. It's aboutJoni Ernst doing NOTHING about pork when she had the chance as a legislator. So much for cutting port there Joni. Braley isn't implying Ernst is a chick anymore than Ernst is suggesting that Braley be castrated like a pig. So the Democrats are saying Joni Ernst did the opposite of what she promised? Are they trying to win this election or saying they hope to support her presidential run in 2016 to continue Obama’s legacy? One got to laugh here. So, it is OK to come up with an Ad showing pigs without lipsticks while squealing, BUT not OK to show an Ad of that nice little chick making a soft noise! November can't come fast enough! It is disrespectful and chauvinistic to compare Joni Ernst to a chick – and that ad should be withdrawn immediately. Joni Ernst is happy to talk about the bills she co-sponsored to reduce spending and allocate money differently. I agree with Mitt Romney, the Des Moines Register newspaper, and the US Chamber – Joni Ernst for Senate! If Democrats were truly honest in their mission vision and values of their party, they would need to change their brand name to the "Hypocrite Party". Then maybe honest people would feel good about casting a vote for an honest candidate. I watched the video and at no time did I think it compared her to a baby chicken. In her video she used hogs so this video added another barnyard animal. It's funny to watch the extremes the GOP and others on the Right will go to just to play the victim card. How is saying "hearing a peep" and showing a chick degrading women? Is political correctness so bad now days that we have to consider how someone might infer something not even being said? Another attempt by the GOP to create a female political star...they love them. Problem is that the GOP doesn't do a very good job at vetting, so they usually look silly supporting a racist or other type of extremist. The GOP exterior has become a cobble of extreme special interests to garner votes, but the real agenda is to control the Treasury and laws to guarantee the continued dominance and greed of a habdful of absurdly rich people by using these special interests to fool people into voting against what is right and good for themselves. I personally don't know how a woman, person of color or LBGT could choose to be a Republican, unless you are in the .1%, None of the policies of the GOP support women, minorities, the poor and certainly alternative lifestyles.